Gaborone, Botswana—At the Bontleng Clinic outside of Botswana’s capital, nurse Gracious Dithabang is the authority on cervical health—and the only health care provider on staff with the knowledge and skills to provide a low-cost, effective approach for counseling, screening and treating women to prevent cervical cancer. Affectionately known as Mma D, Dithabang is a pioneer of the government of Botswana’s National Cervical Cancer Prevention Program. “We introduced the program to the women [in 2009] and they liked it very much . . . women are concerned about their lives,” she explained. Now the potentially lifesaving see-and-treat approach is being scaled up around the country through the Ministry of Health (MOH) and a Jhpiego-supported project funded by the US President’s Emergency Plan for AIDS Relief (PEPFAR) through the US Centers for Disease Control and Prevention (CDC) and the Pink Ribbon Red Ribbon (PRRR) partnership. The need for preventing cervical cancer is most pressing In Botswana, a middle-income country with a population just over 2 million and 23 percent HIV prevalence1, cervical cancer is the leading cause of cancer deaths among women. Women in Botswana die of cervical cancer at nearly twice the rate of the second leading cause, breast cancer. Cervical cancer is also the most frequent cancer among Batswana women, accounting for about a quarter of all female cancers in Botswana. Until recently, the main tool for cervical cancer prevention (CECAP) remained the Pap smear, a more complex screening method that requires laboratory support and multiple follow-ups and is more difficult to scale up. The MOH, recognizing these challenges, is looking to the see-and-treat strategy to improve coverage and reach more women. Jhpiego has been working since July on the CDC/PEPFAR/PRRR project. 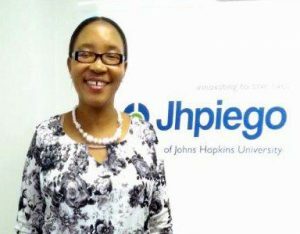 Jhpiego focuses on strengthening the capacity of Botswana’s National Cervical Cancer Prevention Program, scaling up primary and secondary screening services to reach more women countrywide, and developing a sustainable platform to provide services long term. Botswana women gather at a health facility for a Jhpiego-supported group counseling session on cervical cancer prevention and screening. Photo by John Varallo/Jhpiego. The project, in collaboration with the government of Botswana, aims to ensure that the majority of women aged 30–49 years and at least 80% of sexually active women with HIV will have access to cervical cancer screening and treatment for abnormal results. In addition, the project is working toward providing the human papillomavirus vaccine to at least 80% of all girls aged 9–13 years. As part of the see-and-treat strategy, women who receive VIA are given their results on the same day and are then offered immediate treatment with cryotherapy if eligible or a specialized treatment, known as loop electrosurgical excision procedure, for larger lesions. 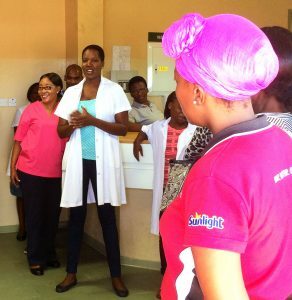 Bontleng is currently the only clinic in the greater Gaborone district that offers VIA services, and as the only trained provider in the clinic, Dithabang often struggles to serve all the women who seek care. Jhpiego is helping boost services at the Bontleng Clinic by providing knowledge and skills training to additional providers and opening more clinics in the district and elsewhere in the country. Training more providers like Dithabang is a critical component of Jhpiego’s strategy to increase service availability, and the project team has worked in close partnership with her and her peers to utilize their skills as trainers and mentors to expand coverage. Through her VIA work, Dithabang is having a substantive impact on improving the health of women in her community. Her dedication is well recognized by clients who frequently make use of the clinic’s suggestion box to express their appreciation of the services. This recognition has been one of her greatest motivators. Building on the success at Bontleng Clinic, Jhpiego is supporting the MOH to convert the site into a CECAP training hub, capable of providing hands-on learning to other providers who can then bring high-quality CECAP services to their districts.